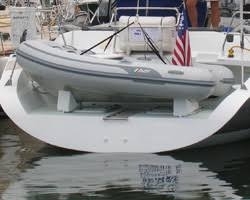 This model will fit all rigid bottom and RIB boats up to 400 pounds including outboard. This removable model chock will fit all rigid bottom and RIB boats up to 500 pounds including outboard. They come two pieces to a set with the front piece measuring 25 inches across, 6 inches wide, with a center height of 5 inches and an end height of 11.5 inches. 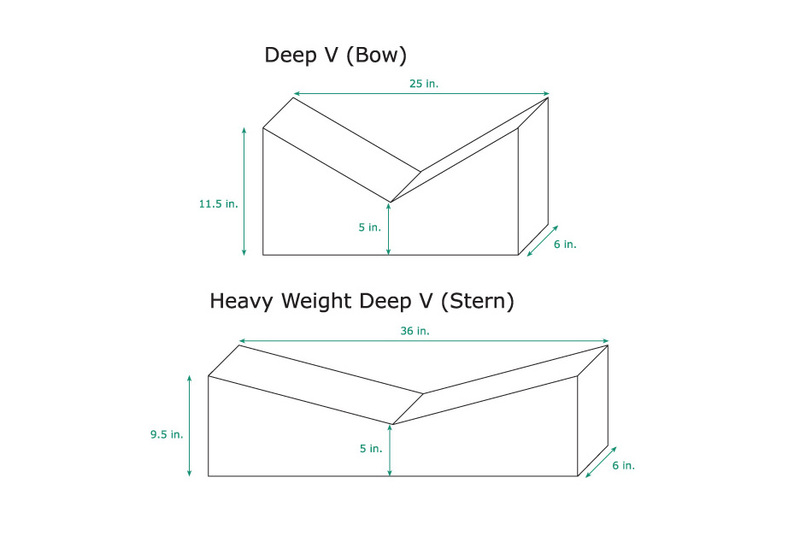 The stern piece section measures 36 inches across, 6 inches wide, with a center height of 5 inches and an end height of 9.5 inches. Each chock weighs only 4 lbs and the exterior fabric is tough, weather resistant Sunbrella. 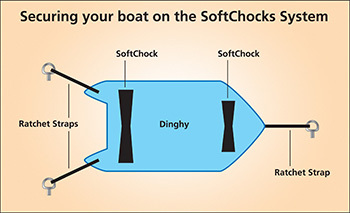 These chocks can also be used as a dinghy cradle or dinghy storage. Stainless steel female snaps are already installed to side tabs. Male snaps must be installed on the deck. If you prefer not to install the snaps on your deck, you can secure the boat (while resting on the chocks) to the deck using ratchet straps. Chocks are available in white, light gray or special order black, dark gray, navy blue or red will require two additional weeks for delivery. NOT for submersible swim platforms as they are too bouyant. See the related products section below for stainless steel ratchet straps (highly recommended as an added precaution). We would like to thank you most sincerely for your excellent service, prompt credit for the shipping costs and the soft chocks are perfect for our application. We will pass the word around about your site, service and reliability. Stainless steel ratchet strap in 10 foot length. Stainless steel ratchet strap in 5 foot length. Replacement Skin for Large SoftChocks, white or gray, sold individually. Replacement Skin for small SoftChocks, white or gray, sold individually. Achilles repair kits contain two o-rings, two pieces of gray floor fabric 6" x 6", two pieces of colored hull fabric 6" x 6", emery cloth and a tube of Achilles glue. Achilles plastic valve for riverboats for SU series boats. Achilles plastic "H" type floor joint for any sport tender or dinghy that uses plastic joints. Measures 24" long x 1-3/4" wide. (Achilles Part #SC392GY). The Weaver Universal Dinghy Chocks with 3.5" x 3.5" pads are made from rugged marine grade stainless steel with hypalon rubber molded pads. Expanding flip-up style drain plug measures 7/8" in diameter or 1" in diameter. Fits Caribe, AB, Achilles, Zodiac and Walker Bay inflatables. Plug is black in color. Buy 3 or more and save $2.00 each. Achilles metal motormount for older ST/DT models. (Achilles Part #DC541).